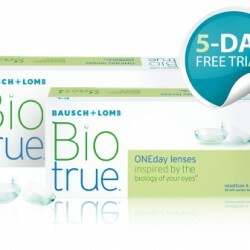 Till 31 Oct 2015 Bausch + Lomb: Biotrue ONEday lenses 2 boxes for $98 Register for Free 5-day Trial! If you wear contact lenses but often experience dry eyes, try Biotrue ONEday lenses from Bausch + Lomb which is made with a new revolutionary HyperGelTM material that is better for you, and better for your eyes. While other lenses may experience a natural decline in eye moisture, Biotrue® ONEday helps retain up to 98% moisture for up to 16 hours through the day. Farewell to rubbing your eyes towards the end of the day. Get 2 boxes for $98 (UP $120) from participating optical shops from now till 31 October 2015! If you would like to try it first, register at their website for a Free 5-day trial!